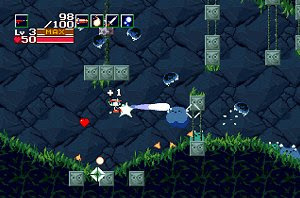 Cave Story, or Doukutsu Monogatari, is a Japanese freeware PC side-scrolling platformer game developed by Studio Pixel . It has been translated into English by Aeon Genesis Translations and will have an official translation script published sometime in the near future. Cave Story is really one of those games that can be considered a masterpiece of game design. There are so many wonderful and classic gaming elements, that cannot even begin to be described. There is just so much effort, originality and ingenuity behind this game and it really shows more and more as you play through it.